What is a modified or adapted FODMAP diet? There is a new term starting to emerge in relation to the low FODMAP diet and this is the modified FODMAP diet. Put simply this is the long term diet the majority of people follow after completing the reintroduction phase of the low FODMAP diet. People with IBS who have been fortunate enough to see an experienced FODMAP dietitian will have had explained to them that there are actually 3 phases to a low FODMAP diet. Those who could not get access to a dietitian or have chosen to try the low FODMAP diet themselves may probably not have realised the low FODMAP diet has 3 phases. Certainly if you obtain most of your information from the internet the reintroduction phase and the long term maintenance phase which involves a modified FODMAP diet are rarely mentioned. I have to admit the research into FODMAPs and IBS is pretty slim on these important phases too unfortunately! The figure shows these 3 phases and is explained below. So what are the 3 phases of the low FODMAP diet? 1. The first phase is the low FODMAP restriction (or elimination) diet. This is what most people know as the low FODMAP diet but this phase of the diet should only be followed for 2-6 weeks. 2. The second phase of the diet is the reintroduction phase. This involves both re-challenging and reintroducing FODMAPs to test your tolerance levels to FODMAPs and understand your FODMAP threshold. This phase takes about 10 weeks to complete. In a way it continues indefinitely as your tolerance to FODMAPs can change over time and you continue to re-challenge and reintroduce FODMAPs. More on reintroducing FODMAPs here. 3. The final phase is termed the personalisation phase and involves a modified (or adapted) FODMAP diet. 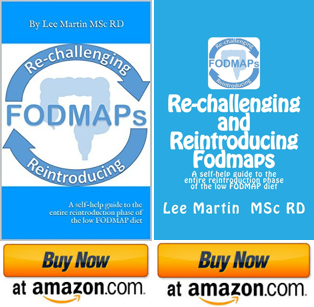 Once you have completed the reintroduction phase and reintroduced FODMAPs back into your diet most people will still restrict some high FODMAP foods. This combination of eating high FODMAP and low FODMAP foods to personal tolerance results in a modified low FODMAP diet. There is limited research available on what people do once they have completed the 2-6 week low FODMAP diet. Earlier this year (2015) I presented an abstract while working at King’s College London at the Digestive Diseases Federation conference which looked at the long term effects of the low FODMAP diet in the UK. The research answered some very interesting questions…. Question 1. Do people reintroduce FODMAPs after starting a low FODMAP diet? In fact 97 out of 103 people completed the reintroduction phase. Showing that with the education and support from an experienced FODMAP dietitian nearly everyone is able to complete the reintroduction phase. Therefore the vast majority of people do reintroduce FODMAPs but continue to follow a modified FODMAP diet as their ‘normal’ diet. 3. After you have reintroduced FODMAPs do you still have relief and control of your IBS symptoms in the long term? There are two important statistical points here. First of all 61% of people found relief of their IBS after following a low FODMAP restriction diet. This is similar to other studies looking at the effectiveness of the restriction phase of the low FODMAP diet. Secondly and most importantly in those 61% of people 70% of them continued to have relief of their symptoms a year later. The abstract of my study and presentation from the DDF event is available here. It is great that questions regarding all three phases of the FODMAP dietary treatment are starting to be answered as it helps the low FODMAP diet become a long term treatment option for IBS symptoms. It also means that information about all three phases of the low FODMAP diet will become known to more people. Hopefully this will result in more support for those who are following only phase one of the low FODMAP diet and are unnecessarily restricting their diet. The study also looked at quality of life, the long term nutritional adequacy and acceptability of the diet with some really interesting findings which I will discuss in a later post. Recently Monash University have also published a blog post on the three phases of the low FODMAP diet which you can read here. Additionally a useful and practical article on the modified FODMAP diet can be found on ‘A little Bit Yummy’ here. Interesting to see recognition of this 3rd phase which I’ve been practicing for a few months. It will help sufferers eat better balanced diets. My low FODMAP cookbook (out soon) will hopefully be a useful resource to find practical recipes. Hi Penny, There has always been a ‘maintenance’ phase but the terminology explaining this is only just starting to be thought about. The whole low FODMAP diet is still relatively recent in terms of a medical treatment so lets hope a lot more information is produced to help people complete all three phases. Nice article guys and we’ll done for pushing this forward. As a dietitian it concerns me that many people see the elimination phase as a long term solution for IBS thus severely restricting their diet leading to long term health problems through malnutrition. Thanks for your support Vikki 🙂 A lack of reintroduction can become a major fault with the way the current low FODMAP treatment is set up. Also doesn’t help when media and websites promote a low FODMAP restriction diet for life. I have to admit that I do think the research is slightly at fault here as well. So much emphasis has been placed on the low FODMAP restriction diet with little input from the patients themselves on what difficulties they have and what happens after they have done the initial phase of the diet. Maybe in the future there will be a less restrictive form of the low FODMAP diet that still achieves symptom relief so reintroduction is not such a long and difficult process for many. Let’s keep pushing that reintroduction!